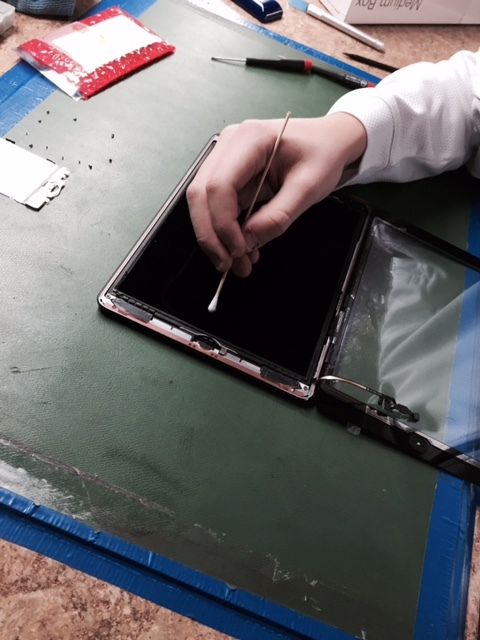 iPad Mini 3 screen repairs- now at Mission Repair! iPad Mini 3 Glass and Screen Repairs! It’s starting to get a little confusing with all of these models, and you might even point out that the iPad Mini, iPad Mini 2 and the iPad Mini 3 all have the same from glass panel. THIS IS NOT TRUE! The iPad Mini 3 has a different size home button opening in the glass, so you CANNOT interchange these parts between the generations. Just letting those technicians out there in the DIY community know. These units do not have a fused glass, digitizer and LCD assembly, so if you break one, you don’t have to replace the other. This is unlike some of the other iPad models (like the iPad Air 2) that we can’t simply replace the “glass only”. This is good news for it’s “repairability” and longevity. Thanks for reading friends, I’ll be back soon with more Mission Repair info. That’s right! All month long we have discounted our 1st and 2nd generation iPad Mini screen repairs and this sale comes to an end Thursday, 4/30/15 at midnight. May is right around the corner and we wanted to take a moment to remind our customers of our April Deal of the Month while it lasts! 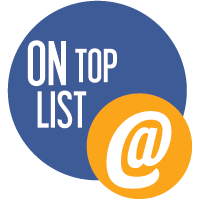 There is no coupon necessary, simply order your repair online, stop by one of our walk-in locations, or give us a call at 1-866-638-8402 to receive the discounted price! Hurry in today to save on iPad Mini Screen Repair. Click the links below to get started. Deal of the Month: iPad Mini Specials! April is here and this month we have marked down the 1st generation and 2nd generation iPad Mini glass repairs. That’s right. Our April Deal of the Month is for iPad Mini 1st Gen and 2nd Gen front glass repair services. If you are have a cracked screen on your iPad Mini NOW is the time to visit Mission Repair and get that shattered glass replaced. Now through April 30th iPad Mini 1st Gen Front Glass Repairs are $99 (regular price $119). In addition, 2nd Gen iPad Mini Front Glass Repairs are marked down to $89 (originally $99). No coupon necessary! Our repair services include parts and labor and come with a one year warranty against any defects to the replacement screen. Screen repair services ALSO include our Got Repair benefit in which you’ll never have to pay for the same repair service twice. Have you recently cracked the screen on your iPad Mini? Give us a call at 1-866-638-8402, visit one of our walk-in locations or click on one of the images below to get started. This Deal of the Month won’t last forever so start your repair today! Accidentally crack the screen on your iPad? There is nothing more frustrating than dropping your precious tablet face down, only to pick it up and discover that the screen is shattered. 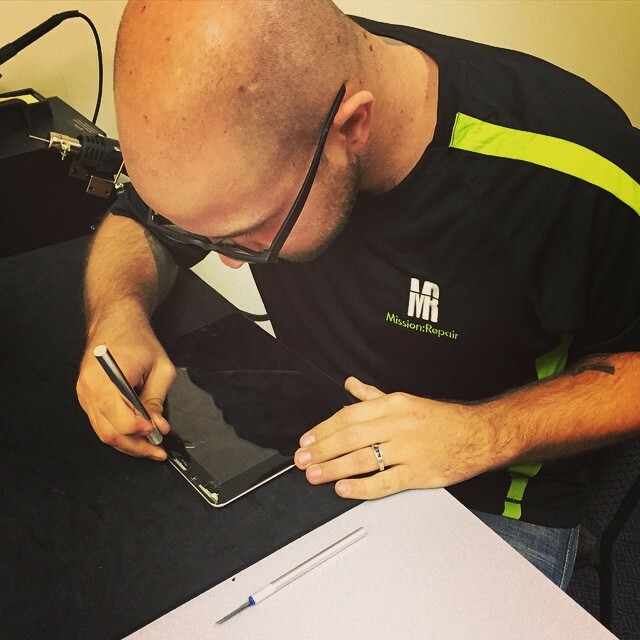 Mission Repair is here to help and our certified technicians can take care of any iPad repair you need. We focus on our customers and know what it is like to be without our devices. Our technicians will repair your iPad carefully and quickly! If you are local to any of our locations in the Kansas City or Denver area we have same day service options to fit your needs and can repair your iPad while you wait. That’s right, stop by one of our walk-in locations, make a target run or grab coffee, come back and your iPad will be ready for you! Not local to us? No problem. We also take nationwide mail-in devices and our website check-out process is easy! We have been in the business since 2008, have heard just about every different kind of story for how our customer’s iPads have been damaged, and we have your back. 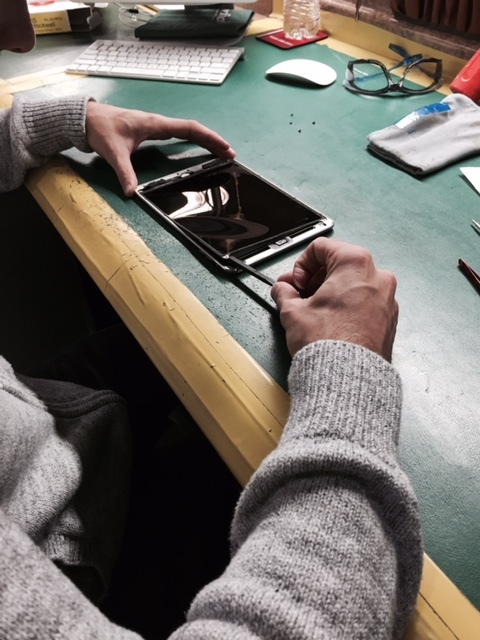 Even if you are in need of a repair other than the screen, we can take care of it. Simply give us a call at 1-866-638-8402 to speak to a customer service representative or click here for our full line of iPad Repair Services. Nothing can ruin your day faster than dropping your iPad face-down on a hard surface. An accident like this takes seconds and leaves you with a shattered screen. We understand that these situations happen, and we here at Mission Repair are on your side. We’ll get your iPad repaired and back to you anywhere in the USA, FAST. The best part? Our repair services are AFFORDABLE. Once we receive your device we remove the shattered glass, clean the LCD underneath of any dust and install a brand new glass and digitizer to your iPad. Our certified technicians work on hundreds of iPads a week and they know their stuff! We are in the business to help our customers with any repair needs they may have. Whether you live up the street from our walk-in locations or are mailing your device in to our repair service – Mission:Repair will take care of it. We have been in the business for 8 years and are committed to providing quality iPod, Smartphone, Tablet and Laptop repairs. In need of a repair or a FREE diagnosis? Give us a call at 1-866-638-8402, send us an email or visit us at www.missionrepair.com. Have you recently dropped your iPad Mini, resulting in a cracked screen? We know this situation all to well and are here to help. We work hard with our part suppliers to give you the best price we can on screen repair services. This is especially true for the iPad Mini Screen Repairs we offer. Mission:Repair’s certified technicians will replace the glass on your iPad Mini and get your tablet back to you in great working condition and for a great price! iPad Minis require special opening and soldering techniques so be sure to get it into Mission:Repair for your screen replacement. To place your order, simply visit our website, give us a call at 1-866-638-8402 or stop by one of our Kansas City walk-in locations. Not local to Kansas City? No problem, we specialize in mail-in repair services. Our shipping options and instructions make it easy for you to get your device to us safely. So, if you have a cracked screen on your iPad Mini or if your iPad Mini with Retina Display is in need of a front glass replacement, click on one of our services below or give us a call today or click on a service below to get started.